I know it’s been a while, but I wanted to at least dust this site off a bit and post something. I’m working on a few projects right now and will be posting more stuff. Here is a cool video of a very talented actor/artist Terry Crews. He is painting in the form of Bob Ross. He has some good advice for any artist or person that is trying to create. 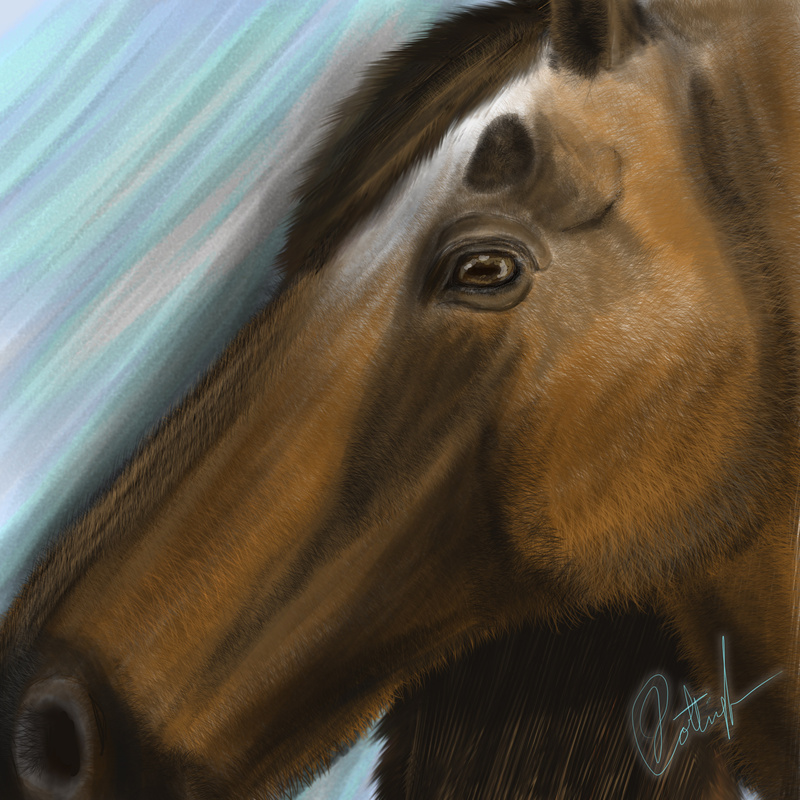 Switching things up for a bit, decided to do some Digital art. Basically it is a major challenge for myself, because I’m use to drawing directly on the paper. Where as drawing with a stylus on an external pad and looking at a monitor is really a challenge. The cool thing is that its much easier to fix mistakes made on a computer than on paper. The bad thing is that its a lot of coordination is needed. Unless you have a computer that allows you to draw on the screen, it’s no where the same as drawing on the paper. 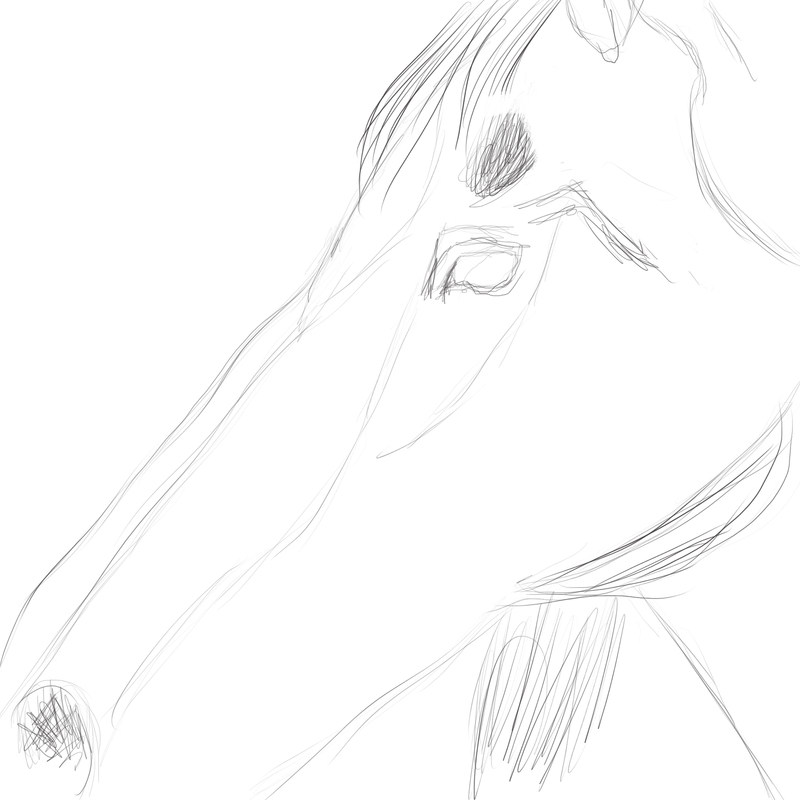 First I laid out a basic sketch of the horses head. I used a base layer for this and a basic brush. 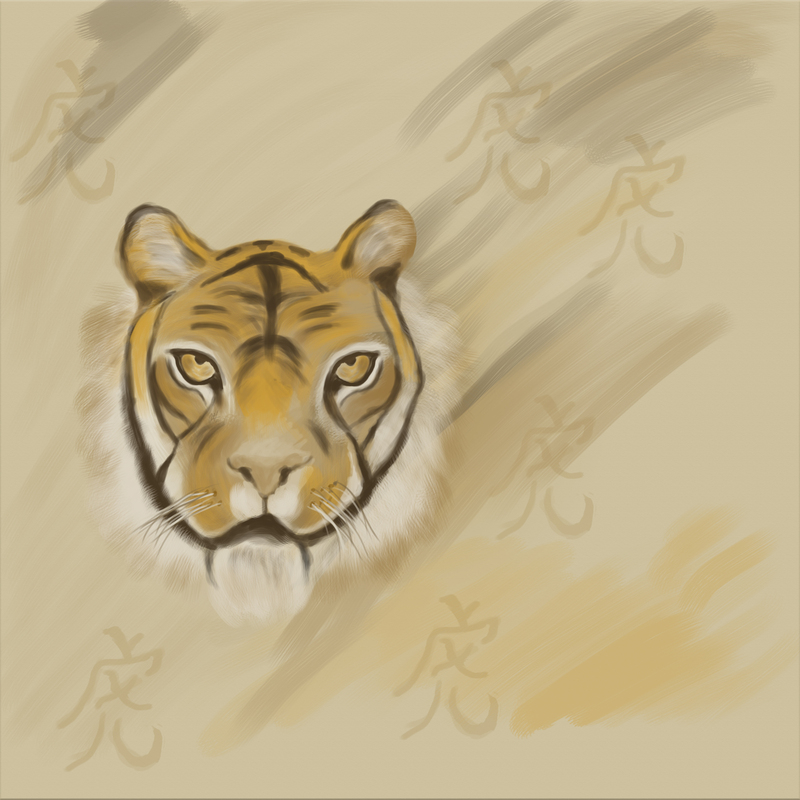 Afterwards I started to build the textures of the fur and shadows up by layer by layer. How to rid yourself of Type 2 Diabetes, lose weight and more – Is it possible? Diabetes has become serious plague on human health in the past twenty years. There are different types of diabetes. Type 1, usually means the pancreas cannot produce any insulin and requires daily insulin in order for the person to survive. Type 1 is the most severe form of diabetes and usually requires a pancreas transplant. This condition is usually from birth, where as the other, Type 2, is usually in adulthood. However there are more diagnoses in today’s youth than in previously recorded history. Type 2 is when your body becomes insulin resistant. Your pancreas is producing too much insulin and your body cannot process the excessive amounts. This can cause the pancreas to work less and less over time. Diabetes can lead to excessive weight gain, high blood pressure, heart disease and even losing body parts like toes, feet, legs etc. Eyesight is also at jeopardy at this point. Some people have gone blind. I was diagnosed with Type 2 about three or four years ago. Before then I was pre-diabetic. I began to have issues with being tired all the time among other things. Eventually I started to take medications like Metformin and Glipicide. Over time my dosage had to be increased. My average sugar reading was around 300, normal would be around 100. My eyesight got a little worse, however, I did not have any issues with any of my appendages. My A1C was around 9.8, which is very high. Normal A1C levels would be around 5. To learn more about the differences between the two types, check out the WebMD article link here. As with any diagnosis of bad health, there comes the plethora of diet, exercise and nutritional suggestions and recommendations from your health care provider, nutritionist, family members, friends, tv, internet, books….you get the drift. Basically it’s an information overload and you do not know what to try first. I have tried different diets and exercise plans. I did lose weight, but would either get burned out on the exercise or stop losing weight all together. Then I would start to gain the weight back and then some. I stuck to eating Fat Free foods, super duper diet breads, pasta, salads and drank diet sodas. I cut back on the calories and tracked all my meals using different methods including the MyFitnessPal application that I talked about in the previous article. Sugar – The good, bad and just plain old ugly! Sugar is in just about everything and too much sugar causes the liver and pancreas to work overtime to process it. Eventually your body will build up a resistance to the excess amounts of insulin and then you have diabetes. Weight gain is sure to follow. Why does sugar cause the weight gain? It’s basically for a few reasons. One is, insulin is a hunger hormone, the more of it in your body the more hungry you feel. The other is that the first response to too much sugar, is to store it as fat immediately. Sugar is very addictive and has proven to be more addictive than cocaine in a study with mice. Also MRI technology has shown comparative pictures between brains on cocaine and brains on sugar. Crazy thing is, both images show almost exactly the same amount of stimulus. This shows that a drug as bad as cocaine has just the same effect as sugar. 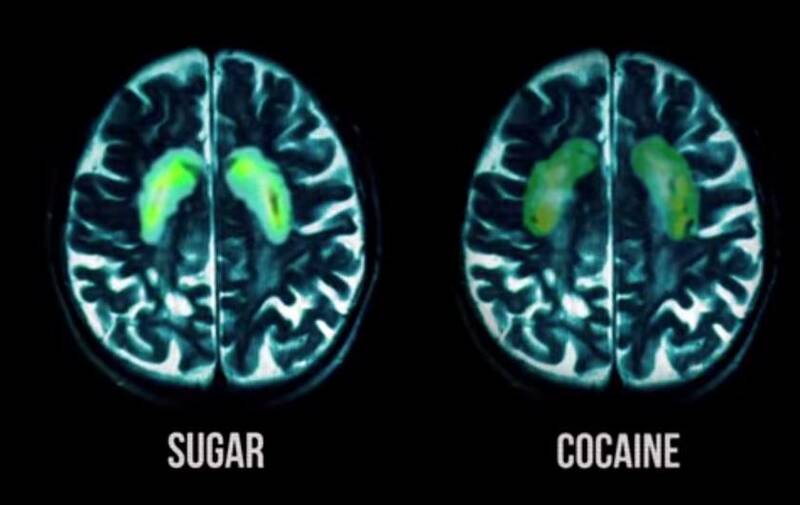 A comparison brain scan of a person consuming sugar and a person consuming cocaine. Here is a link to an article from huffintonpost talking about it. You can access it by clicking here. If you want to loose weight and help your diabetes go away, then you should check out the article. Here are a few videos about the relationship of sugar, diabetes, weight gain/loss. I hope you find them as helpful as I did. Needless to say, other than having Weight Loss Surgery, the changes I made actually worked in getting rid of my Type 2 diabetes. I don’t know if it will work with everybody, but it might. I’m not a doctor and any advice or experiences I’m sharing should always be discussed with your doctor. Keep this in mind, carbs are basically another word for sugar. Carbs are found in Fat Free foods, sugar is needed to make the food taste better. If it’s Fat Free it’s actually worse for you. Fat’s are not the issue and Fat Free is an illusion. If you look on the back of a bag of sugar it will not have any fat. Yep, that’s right Sugar is fat free!!! Or is it??? Remember sugar is transformed into fat as soon as it enters the body. Calories are not the issue, because calories are not the same in everything. Calories from a can of soda and a handful of almonds are completely different things and one will become instant fat storage if you take it. Can you guess which one??? Below is an excerpt from a documentary I watched called “Fed Up”, you can find it on Netflix. It is a really good documentary and was very instrumental in my education on getting my health in check. I will share more information about other documentaries, books and studies as time progresses. If you like this post and want more information please leave a remark in the thread below. Giving you a quick update and sharing something awesome. 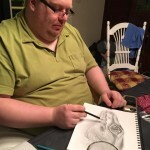 I’m working on more articles for the weight loss journey and getting back into the art again. I wanted to share another great artist Leonardo Pereznieto. He has a YouTube channel and creates most interesting drawings using everything from expensive pencils and paints to cheap Bic pens. I have one of his books and it is definitely very informative and really inspires me. The videos are very informative and I think will give you guidance in the right direction. If you have some time you need to check out his channel on YouTube. The link is below. Here is one of his videos of him drawing and painting a 3D Sphere with a Chrome effect. Anyone who knows me, knows I love to put concepts into analogies. Some people say I have a gift for it and some say I know way too much about movies, tv and sci-fi. Lets take a look at what we need to help us with the weight loss. Just like Batman using one of his awesome “bat”-gadgets to defeat the bad guys and save the city. We too have to use special tools and knowledge to save ourselves. So lets start by going to our secret base of operations and go over our good health weapons and tools. Portion control is crucial in this adventure. Without portion control we will either eat too much or too little. Portion control will also help use to keep track of how much nutrients, proteins, carbs, fiber and fats we will consume. These measurements will help to ensure we get the right ratios into our bodies. A portion control check tool can be either a food scale, measuring cup or storage container. The key is to know what you are trying to measure. I tend to use the food scale as much as possible. You can buy one for little money on Amazon, Walmart, eBay or ask for it as a special gift! I highly recommend that you get one. I also use measuring cups and spoons for items such as liquids or powders. Batman cannot be a great detective without the use of his bat computer. 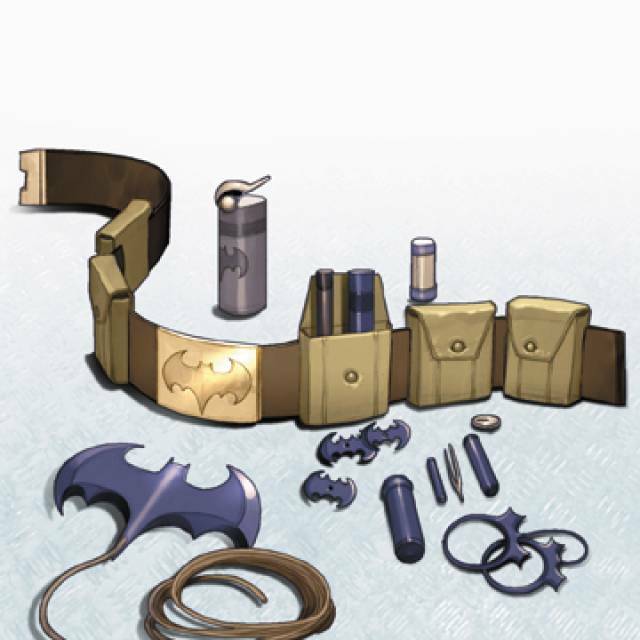 The bat computer provides detailed analysis of every known element and has detailed information about his enemies and allies. With this knowledge, batman can make strategic decisions on how to defeat either one. He can also maintain information about elements or enemies that can cause harm to himself by just being around them. If he knows that an enemy is radioactive, he can wear a bat suit made of lead. Just like batman, you need to know everything about your friendly food and your bad food. There are a few applications freely available on the web that can help you identify and track every type of food that you can encounter on a daily bases. With this knowledge, you will have a better chance at conquering what is keeping you overweight and initially sick. The application I like best is called “MyFitnessPal”, there is a paid for version and a free version. The application is available for all platforms Apple iOS and Android. You can also access the application on the web at https://myfitnesspal.com/. You can use Facebook to create an account. This application has many features that can help you track your daily intake of food. I will make a dedication article on all the features you can do with this app at a later point. Just like batman using some sort of sensor in his suit or vehicle to monitor his health, suit integrity and power usage. The sensors can also tell Batman when to move around or get out of the way. We tool need similar tools to help us diagnose our body’s power usage, activity levels and sometimes our sugar levels. The tool can also serve as a motivation for change in activity. I like to use a monitoring device such as “FitBit”. It is a smart watch that has sensors that can track most of your exercise and movement activities and on most models track your heart rate. With this information you can ensure you are at peak efficiency on fat burning and getting the right amount of exercise in. It also has many other features such as motivation reminders. Basically it will bug you to get up and move around if it finds you are sitting still too long. Sometimes we need that little jolt to get moving. The other nice feature the watch has is the ability to monitor your sleep activity. Why is this important? I will go into that another time. Glucose or blood sugar meters. If you are a diabetic, you need to keep track of your sugar levels. One reason is to ensure that you do not go into a coma, the other is to ensure your Glucose levels are remaining in the normal range. This is important and I will provide information in another article to explain in detail. Just like batman takes a special pill to counteract some poison or provide him with a boost of energy, we too need something similar. This is essentially in the form of vitamins. Vitamin supplements are going to be very important. Generally we do not get enough vitamins in our diet and this leads to issues with getting sick, lack of energy and our body’s need to crave more food to compensate. At first I used one a day vitamins for men. My wife used one a day for woman. After I had my surgery I had to switch to a special bariatric vitamin supplement to ensure I get the daily amount of required vitamins. I will explain more about this in another article. That’s enough for now. I encourage you to check out some of the suggestions in this article. If you do not have the resources to buy a smart watch, don’t worry about it. I will put together other things you can do on a shoe string budget. I hope you found this article helpful. If you have a topic you would like me to focus more on, please suggest something in the comments below. It’s been a while, I have been busy with a lot of things. After years of struggling with weight loss I decided to consult a bariatric doctor. It was a hard decision for myself, because I had to come to terms with myself needing the help. I consulted a surgeon that I met after my wife had her gallbladder removed. My primary doctor had been trying to get me to consult a surgeon for years, wrote me multiple referrals, but I would find some way out of the appointment. I guess it was due to my pride that I could handle this journey without any help. A few years went by and I got even heavier. I was diagnosed with Type II diabetes and my A1C was out of control. I had no energy to exercise and when I did my joints were hurting due to the excessive weight. The consultations, because of my insurance plan, had to be spread over a sixth month period. 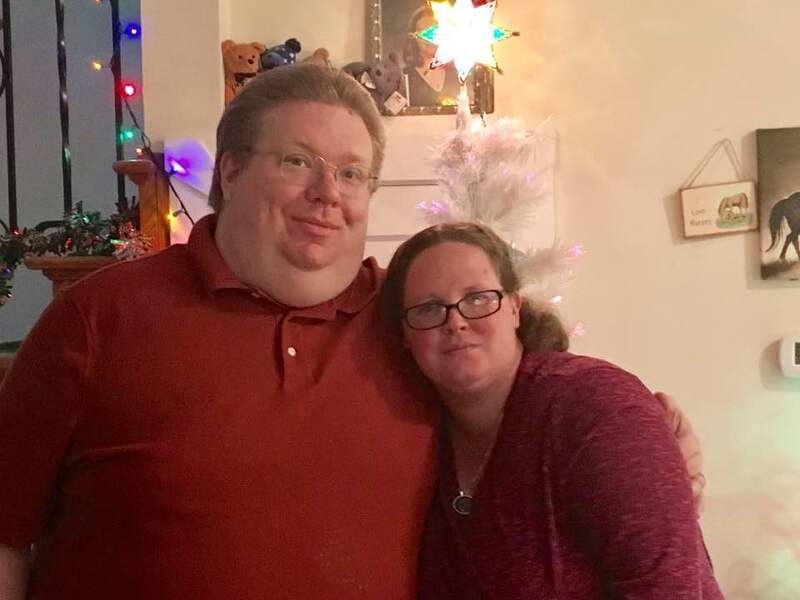 My wife had been struggling with her weight as well, so we both decided to consult the surgeon and get the procedure done the same year. During the six months I started to read, watch videos, and consult anyone who can give me insight into this big decision that I was getting ready to make. I watched TV shows like my 600 lbs life and even reviewed Ted Talk’s. We saw a nutritionist who specialized in pre and post surgery eating for bariatric patients. Per our plan, we had to consult a psychologist to ensure we are of sound mind and we understand the life long commitment. The great thing about talking to the psychologist was that she had already had two weight loss surgeries for a thyroid condition. She was able to inform us on what life was like after the surgery. On January 25th, 2017, I took the first plunge and had the Gastric Bypass RnY procedure. It was very painful for the first week, but I was fine after that initial week. My wonderful wife supported me through this time of need. My highest weight was 395 lbs and my first consultation visit with the doctor I was 388 lbs. On surgery day I was 361 lbs. Today I am 321 lbs. In less than four months I have loss 74 lbs. I feel great, I only wish I did this a lot sooner. I’m loosing weight and clothing sizes. I’m writing this post to announce that I have decided to share all that I have learned and tried in the area of weight loss. I’m hoping that the information that I provide helps someone to make a change in their life. The change I advocate is knowledge of all the tools out there. Not everyone needs surgery and if you do, then I hope this helps you out. More articles will come, I promise. Also I will be posting more art as well. I figured it is time to get back into the swing of things with my site. Today’s post is not a drawing that I did, but a video of another great artist. The artist in this video is Heather Rooney, she has many videos on youtube that show off her amazing color pencil skills. I started to follow her work about a couple of years ago, when one of her videos went viral. She was just recently featured in Color Pencils magazine, with a self portrait that she did. If you like the video below, you should go to her YouTube channel and checkout the rest. You will be inspired and entertained for hours to come. Hello everyone, its been a while, but I’m back. I figure I would start off a new year with a portrait of one of our Gecko’s. My wife has been photographing them as they roam around their terrarium. 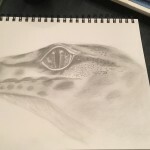 I looked at some of her awesome photos and got the inspiration to attempt to draw a really big portrait of one of the Geckos. Karen, my wife, wanted to spend some quality time together doing arts and craft so it was the perfect time to start another portrait. Sitting around the dinning room table, we all partake in our crafts. My mother was over as well and was coloring in the adult coloring books, which are pretty cool if anyone is interested in coloring. It took about two hours to complete and it was very relaxing. The hardest part was trying to get the bumps to look bumpy in the skin. Further down the Gecko’s body is a section of lots of bumps. 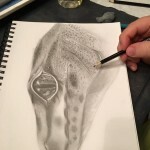 Using the graphite pencils numbers 5H, 3B, 6B, HB, blending stump and a brush I was able to create and manipulate the graphite into the drawing I wanted. The most important thing was to be graceful when filling in the eyes. If I pressed too hard with the pencils I would damage the tooth in the paper and cause it to flatten, which makes a shinning effect, which can ruin the overall picture. Graphite requires you to perform hatching method when attempting to fill in an object. 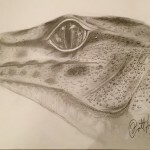 Bare with me and keep coming back to the site you will see more of my drawings. Hey folks, I know its been a little while. Have been busy on a few projects on webdesign for other people. 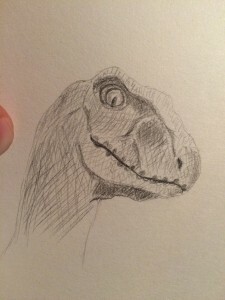 I decided to draw a quick sketch of a Jurassic Park Velociraptor, using just a pencil and blending stump. The drawing took about 20 minutes to complete. It was just fun and relaxing to do something different for a bit. Here is a tidbit of information about Velociraptors. 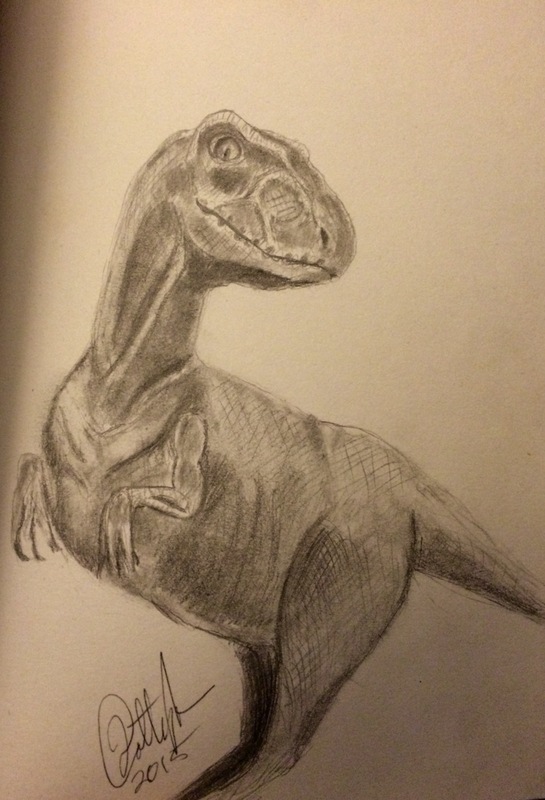 A raptor was only about 2 feet tall and maybe 6 feet long, mostly tail. The average weight would be about 30 lbs. My Eskimo Spitz weighs 35 lbs. Scientist believe that the raptors were feathered creatures. This information was derived from fossils that contained feather marks. 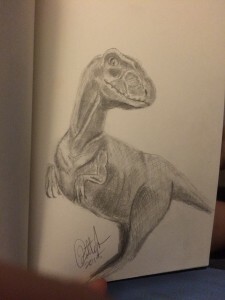 Let me know what you think about the sketch, feel free to comment below. 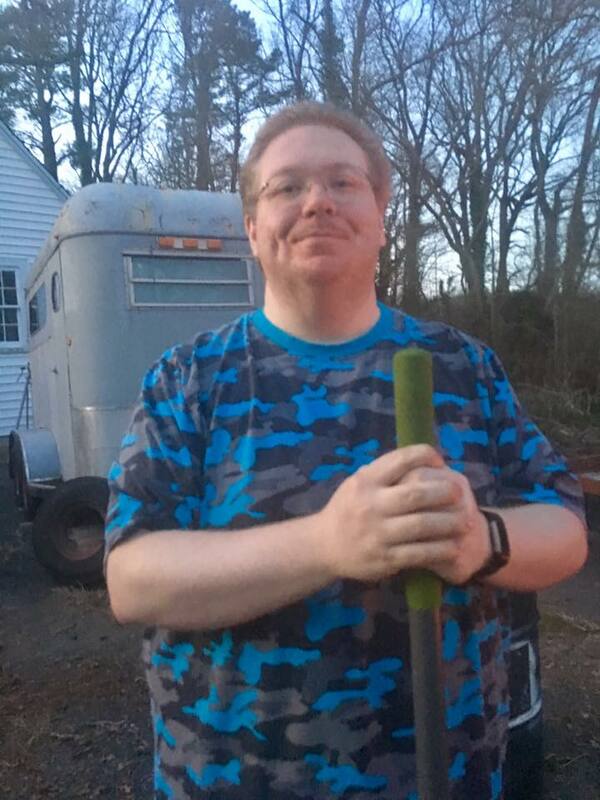 New post added at Jacob Cottingham - Weight Loss Arsenal - "To the Bat Cave!" Just like our superhero batman, you need to arm yourself with the right weight loss tools available. Here is a quick summary of my weight loss journey I started six months ago. I hope this artcile will help others that are struggling. Hello everyone, its been a while, but I'm back. 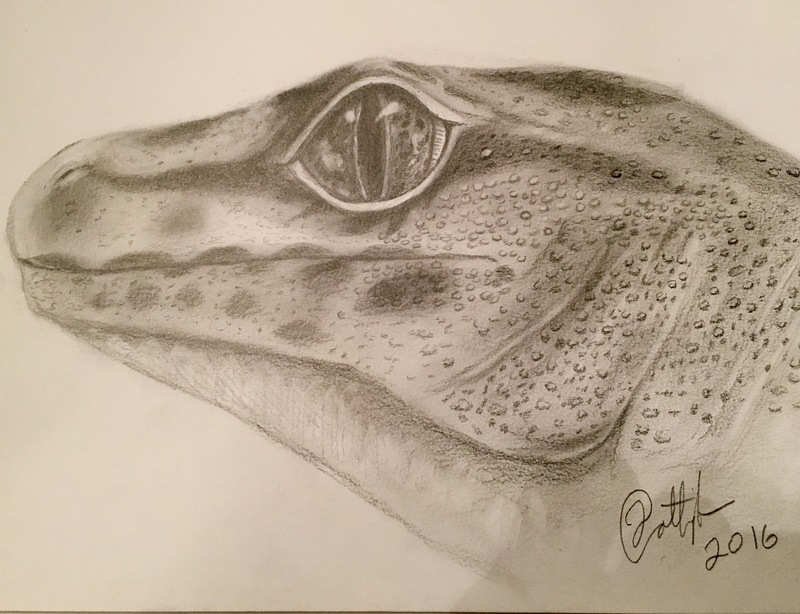 I figure I would start off a new year with a portrait of one of our Gecko's. 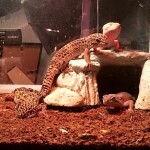 My wife has been photographing them as they roam around their terrarium. I looked at some of her awesome photos and got the inspiration to attempt to draw a really big portrait of one of the Geckos. It took about two hours to complete and it was very relaxing. The hardest part was trying to get the bumps to look bumpy in the skin. Further down the Gecko's body is a section of lots of bumps.